Parkinson’s disease (PD) even to date essentially remains a clinical diagnosis and there are no definitive laboratory tests or brain scans to confirm the diagnosis. Most of these tests are diagnosed to eliminate other diseases that mimic PD. Tremor– Slight shaking or tremor in fingers, thumb, hand, chin or lip. Legs shake on sitting down or when relaxing. Tremors is a common and early sign of PD. The typical PD tremors are also called peel rolling tremors, as if one is rolling peels. The tremors are experienced at rest and usually are mild in nature. They disappear on action and activities like drinking and eating. Micrographia– Sudden change in handwriting which becomes much smaller than the earlier one. The letter sizes become smaller and words tend to be crowded together. 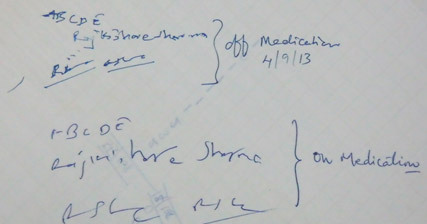 Sudden change in handwriting is often a sign of PD. The handwriting diminishes in height from the beginning to the end of the sentence. This is called micrographia. Rigidity- Patients of PD describe that their body to have become very stiff and the coordinated body movements are lacking making them difficult to carry out their day to day activities like difficulty in arising from chair, turning in bed etc. Bradykinesia- It is characterized by slowness of movements. The patient has decreased arm swing whilst waking.. It is also manifested in other activities of daily living. The relatives often describe that the patient has slowed down considerably in past few months. Loss of Smell- Seem to have more trouble smelling foods like bananas pickles etc. This is one of the early symptoms of PD and it often goes unnoticed. Trouble Sleeping- Patient becomes restless in bed. He often also has nightmares and restless legs syndrome. Some of the symptoms may be related to the stiffness and inability to turn in bed. Gait disturbances– The patient has difficulty in walking. These include, shuffling of gait, loss of balance, freezing, inco-0ordination, fall etc. Hypophonia – Parkinson’s patients develop softer voice (hypophonia) which is difficult to listen. Others develop dysarthria, i.e. the voice is unintelligible and the patient is often asked to repeat the sentence. Masked face- The patient has a serious, depressed or masked look on the face. The face becomes expressionless and lacks emotions with infrequent blinking. Stooping or Hunching Over- Stooping or Hunching over, not standing up as straight. The patient seems to be stooping, leaning or slouching when standing. ON Period: This is the feeling of lightness of the body that you get when you have taken medication. In early stages of the disease, patient mentions that he almost becomes normal so as to perform his daily activities after taking medication. We call it as ON period. OFF periods: These are the symptoms that the patient experiences when the effect of medicine goes away. Patient may start getting tremors or stiffness and find difficulty in moving, walking, and turning in bed or even difficulty in speaking. Some patients also complain curling of toes (dystonia) and pain. Dyskinesia: This is dancing movements that occur as the side effect to medical treatment. They usually are seen after taking medicines at the peak dose effect. However, in some patients, dyskinesias may occur when the effect of medicine is wearing off. One should be able to differentiate this from the tremors as both have different treatments. Swallowing: These patients have difficulty in swallowing. The motor impairment of the muscles in the throat not only impairs swallowing but also poses a risk for aspiration pneumonia. Cognitive and mood disorders: Thirty-forty percent of patients develop change in the mood and behavior. They also develop decreasing memory and confusion. Some of these symptoms are attributable to increased medications and altering medical treatment can benefit them. Some of them can be due to much wider degeneration of brain cells affecting neurotransmitters other than dopamine also. Depression is one of the most common symptom and can be effectively controlled by medication. Another worrisome symptom is hallucination. Hallucination mostly is due to the side effects of prolonged dopamine treatment. Drugs like Quitipine can be used to control hallucinations. Hallucinations can also be controlled by decreasing dopaminergic drugs. Sleep disorders: People with PD often have sleep problems like waking up frequently throughout the night, waking up early or falling asleep during the day. People also experiences rapid eye movement sleep behavior disorder that involves acting out your dreams. Medications may help in controlling sleep disorders. Urinary problems: Patients develop difficulty in passing urine, increased frequency of urination and retention of urine. These problems are common and may result in urinary tract infection. It is also noted that the PD symptoms worsens when there is concomitant infection and hence this should be treated on emergency basis. The help from an urologist may prove useful.